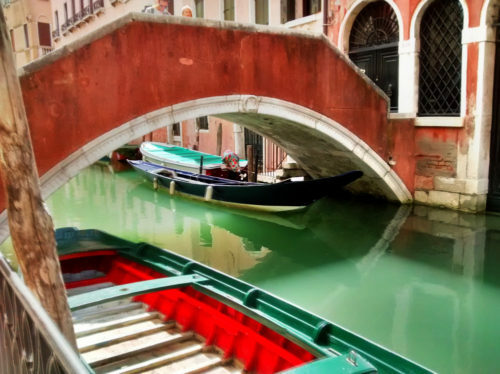 10 Interesting and Funny Venice Facts you did not know! Venice Facts. Everyone who has been to Venice at least once must admit that it is a unique city: the labyrinth of canals, its narrow alleys, the beautiful palaces, the absence of cars. It can be wrapped in mist caused by damp, or covered by snow or flooded by hoards of tourists from all over the world, but Venice seems always to be a part of our dreams. Yet this wonderful city is not only the star of many postcards and movies, but it is also a city full of strange things and oddities.Discover with me some strange Venice facts. Here are 10 things about Venice you did not know! The narrowest street in Venice is called Calletta or Ramo Varisco and it is located on a side street near Campo San Canciano: it is one of the narrowest streets in the world, because it measures only 53 cm. wide at chest level. The word Calle comes from the Latin language and it is the equivalent of street. In Venice, in the past, the routes of communication were the canals. In fact, the main gate of the oldest buildings is always on the side of the canal and the streets are no more than the space that had arisen spontaneously between houses. For this reason the streets are often narrow, winding and without logic! Another one of Venice facts. Venice is divided into 6 districts called SESTIERI ( San Marco, Cannaregio, Santa Croce, Castello, San Polo, Dorsoduro) and the numbers of the houses are numbered according to the districts and not the street. It is almost impossible, however, to find an address if you do not know the way or, even better, the proximity to a certain monument, famous building or shop. In fact, even the postmen often use the street guide to find out where they should deliver the letters. For these reasons, the municipality of Venice has created a page whereby anyone can have access to a map of the City of Venice and find the place and how to get there. Perfect especially for tourists! In addition to mark the hours and call the faithful to religious services, Venetian church-towers worked also as lighthouses for the ships. The bell tower of St. Mark, for example, was covered with reflecting sheets. As well as lighthouses, the towers were also used to control fires. Above the towers were stationed the “guardie del fogo” (fire guards). 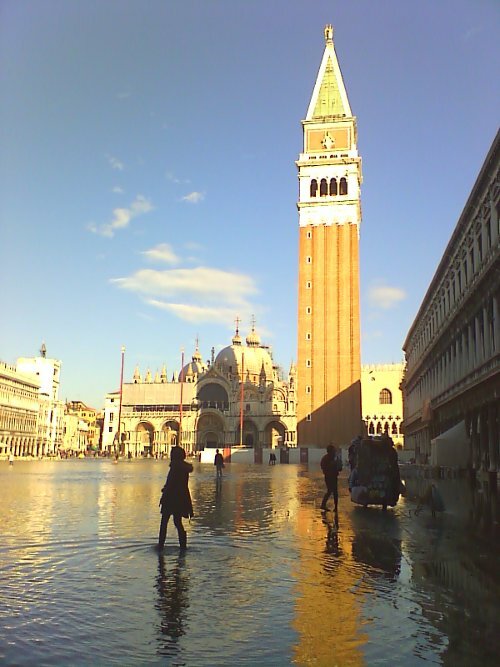 Many towers are crooked because the land in Venice is not the most solid one. The Campanile of San Marco measure 98.6 meters in height. On its summit a golden angel stands and its wings revolve to show which way the wind blows at that altitude. The bell tower collapsed on itself on July 14 1902 – without causing any victims -, it was rebuilt in less than 10 years “where it was and how it was” and it opened on April 25, 1912 on the commemoration day of St. Mark, the patron saint of Venice. 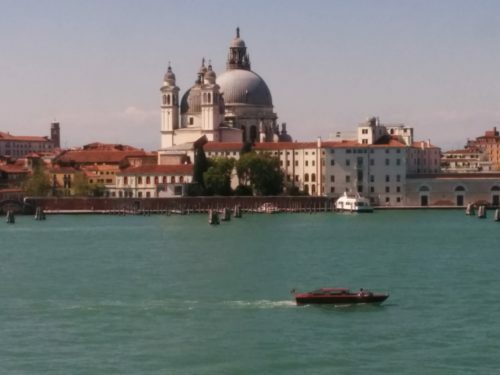 You can go up to the belfry, where you can enjoy an incomparable view of Venice, only by elevator. The bells placed in the bell tower of San Marco are five: the “Maleficio” which announced the death sentences in the Piazzetta; the “Marangona” which marked the start and end of the work of carpenters (or Marangoni) in the Arsenale; the “mezzana” which sounded at noon; the “Pregadi” which announced to the senators that the time of their meetings in the Ducal Palace had come; the “Trottera” which invited the nobles of Venice to put their horses to a trot so they would not be late for their meetings in Palazzo Ducale. The “Marangona”, the largest bell, was the only one that was not destroyed by the collapse of the Campanile di San Marco. 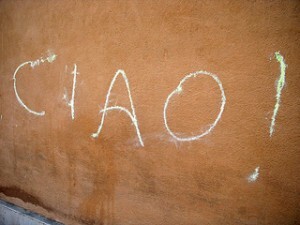 The word CIAO has Venetian origins. So as time went by the greeting became at first “s-ciao” and then “ciao”. The word “schiavo” (slave) has a rather unusual origin: in fact, until the tenth century the Latin word “sclaveni” and then the medieval “Sclavi” stood to indicate the Slavs people. It came to take on the meaning we know today right in between the X and the XI century, when a massive phenomenon of selling slaves of Slavic origin began in the place we now know as Germany. These people were brought en masse to Western Europe becoming the enslaved people for excellence. Why isn’t the water in the lagoon of Venice always crystal clear? For the presence of many rivers that flow in from the northern Adriatic. The sandy bottom, moreover, accentuates the look of opaque water which looks dirty. In ancient times there were two factions in Venice: the Castellani and the Nicolotti. These fights were particularly vicious and they took place on some bridges of Venice, including the Ponte dei Pugni. The struggles could be of three types: a single boxing match (la Mostra), a multi-fight (la Frota), the battle for the bridge (Guerra ordinata). People were cheering from the banks of the canal, from windows, roofs and even by boat. Who could throw the opponent into the water won the fight and was carried in triumph by the people of his faction. Since there were no parapets on those bridges as protection, often contenders fell into the water. The Wars of Fists caused many injuries and, more rarely, some deaths. With the growth of animosity in the disputes they were banned in 1705. In Venice, these wars were replaced in 700, during the period of Carnival, with the Forze d’Ercole. The signs indicating the streets, fields and canals are called nissioeti” (which in Venetian it means little sheets). In fact they resemble small sheets. They are written in Venetian dialect and their translation is very particular: a calle (street) can be dedicated to an ancient craft, a fact that happened there , a legend, a workshop. Elena Lucrezia Cornaro Piscopia was the first woman in the world to be graduated , on June 25 1678. Elena was born in Venice in 1646. 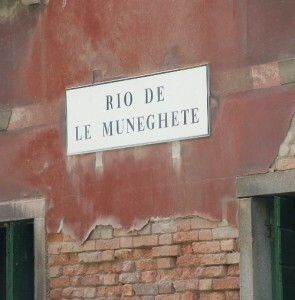 A memorial stone lies on one side of Loredan Palace (now the town hall of Venice, with Ca ‘Farsetti). The first public casino was born here in 1638, as an attempt to limit gambling and moralize the customs of the Venetian lords. Non conoscevo la parola “nissioeti”. Grazie per un post delizioso (e che naturalmente mi fa venire nostalgia: sigh!). Hey. . . Thanks admin. You have posted best information about Venice tourist attractions and its really great that this all is about rare and unknown places. 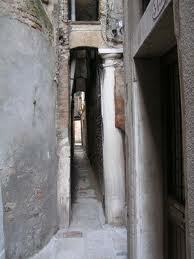 I have visited Venice before in last year and I have visited NARROWEST STREET and PONTE DEI PUGNI. I will definitely love to visit another places as well.